When the shadows rise, it's the end of the world's glory. 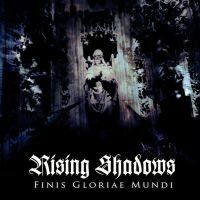 Finis Gloriae Mundi is the third album by Rising Shadows, a project by Fredrik Klingwall. Fredrik started out the project on his own as Shadow of the Concealed, changed the name to Rising Shadows in 1997. The project moved onwards with the joining of vocalist Linda Li in 2004. Their first album Falling Deep Within was released in 2006. In 2008 with the addition of Katatonia bassist, Guillaume Le Huche (who left afterwards), they released their second album, Found In The Cold. Both album were released by Twilight Records. This album was produced by Fredrik Klingwall and Mattias Olsson (Anglagard; he was also involved in the production of the latest Gösta Berlings Saga album, Glue Works). As I haven’t heard the previous two albums, I can’t compare this current one to those previous releases. But based on my impressions of this album, I will track those albums down. Finis Gloriae Mundi has washes of sounds pouring out, immersing the listener in a mysterious world from times past; the music is eerie and beautiful, with ambient elements yet it is focused and succinct, powerful yet delicate. I am reminded somewhat of Dead Can Dance in parts of the pieces here, in ambiance, spirit and sound as well as the female vocalizations and “medieval” and “gothic” vibe. I also felt as this could serve as a wonderful evocative soundtrack to a historical mystery movie. I could definitely picture in my head various scenes of times past to the sounds of Union Of The Fixed And The Volatile, which is a stunning piece. The keyboards sound sublime in this piece; majestic and ominous, they are the hooks at the center of this magnificent composition alongside the dominant slow percussion. The music veers into several directions; the most prevalent one is that of mystery and obscurity. A sense that one is not sure of what is to come next, what is this place we are at currently and as for what it holds hidden in its darkest corners, we can only guess, but that is a good educated guess thanks to the music. Adding to this are some Eastern elements introduced in Fearless and Wheel Of Fire, which add to the mystic nature of this album. The female vocals also contribute to the senses of oddness and eeriness that emanate from the music. Another strong feel in the music is that of imminent danger. Listen to Dissolving The Fabric Of Time and Union Of The Fixed And The Volatile. Those foretell a forthcoming of perils and menace of an unknown and mystifying nature. Yet another prominent sense is that of innocence, purity of mind and naivety, such as is heard on Eschaton, Fearless and Amnesia Revealed. These pieces offer a sort of cleansing from the hazards of the road taken so far in the album, a short interval in this journey. Finis Gloriae Mundi offers an eerie and beautiful musical journey, one that is best experienced listened to with headphones at dark late at night.